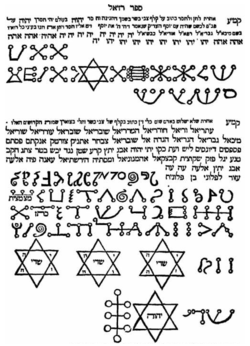 This article is about the use of the hexagram as a Jewish symbol. For the Star of David in Islam, see Seal of Solomon. For use in Christianity and other Abrahamic religions, see Star of David in the Abrahamic religions. For other uses, see Hexagram. "Jewish Star" redirects here. For the newspaper, see The Jewish Star. "Magen David" redirects here. For the halakhic commentator, see David HaLevi Segal. During the 19th century the symbol began to proliferate amongst the Jewish communities of Eastern Europe, ultimately being used amongst the Jewish communities in the Pale of Settlement. A significant motivating factor was the desire to imitate the influence of the Christian cross. The earliest Jewish usage of the symbol was inherited from medieval Arabic literature by Kabbalists for use in talismanic protective amulets (segulot) where it was known as a Seal of Solomon. The symbol was also used in Christian churches as a decorative motif many centuries before its first known use in a Jewish synagogue. Before the 19th century, official use in Jewish communities was generally known only in the region of today's Czech Republic, Austria and possibly parts of Southern Germany, having begun in medieval Prague. The hexagram does appear occasionally in Jewish contexts since antiquity, apparently as a decorative motif. For example, in Israel, there is a stone bearing a hexagram from the arch of a 3rd–4th century synagogue in the Galilee. Originally, the hexagram may have been employed as an architectural ornament on synagogues, as it is, for example, on the cathedrals of Brandenburg and Stendal, and on the Marktkirche at Hanover. A pentagram in this form is found on the ancient synagogue at Tell Hum. In the synagogues, perhaps, it was associated with the mezuzah. The use of the hexagram in a Jewish context as a possibly meaningful symbol may occur as early as the 11th century, in the decoration of the carpet page of the famous Tanakh manuscript, the Leningrad Codex dated 1008. Similarly, the symbol illuminates a medieval Tanakh manuscript dated 1307 belonging to Rabbi Yosef bar Yehuda ben Marvas from Toledo, Spain. A Siddur dated 1512 from Prague displays a large hexagram on the cover with the phrase, "He will merit to bestow a bountiful gift on anyone who grasps the Shield of David." Turcomans who ruled in Anatolia during the 13th century, inherited it from the Seljuk Turks. Islamic coins from the reign of Khalif Nasreddin Mahmoud bin Mohammad, following Turkish influence, sporting a double-headed eagle on one side and the Star of David on the other as early as year 1200. A hexagram has been noted on a Jewish tombstone in Taranto, Apulia in Southern Italy, which may date as early as the third century CE. 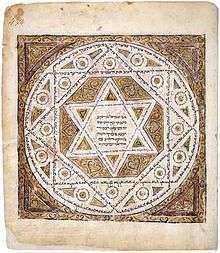 The Jews of Apulia were noted for their scholarship in Kabbalah, which has been connected to the use of the Star of David. Medieval Kabbalistic grimoires show hexagrams among the tables of segulot, but without identifying them as "Shield of David". In the Renaissance Period, in the 16th-century Land of Israel, the book Ets Khayim conveys the Kabbalah of Ha-Ari (Rabbi Isaac Luria) who arranges the traditional items on the seder plate for Passover into two triangles, where they explicitly correspond to Jewish mystical concepts. The six sfirot of the masculine Zer Anpin correspond to the six items on the seder plate, while the seventh sfira being the feminine Malkhut corresponds to the plate itself. However, these seder-plate triangles are parallel, one above the other, and do not actually form a hexagram,. Isaac Luria provided the hexagram with a further mystical meaning. In his book Etz Chayim he teaches that the elements of the plate for the Seder evening have to be placed in the order of the hexagram: above the three sefirot "Crown", "Wisdom", and "Insight", below the other seven. 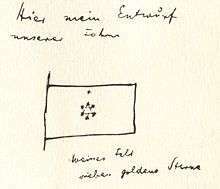 Similarly, M. Costa wrote that M. Gudemann and other researchers in the 1920s claimed that Isaac Luria was influential in turning the Star of David into a national Jewish emblem by teaching that the elements of the plate for the Seder evening have to be placed in the order of the hexagram Gershom Scholem (1990) disagrees with this view, arguing that Isaac Luria talked about parallel triangles one beneath the other and not about the hexagram. The Star of David at least since the 20th century remains associated with the number seven and thus with the Menorah, and popular accounts associate it with the six directions of space plus the center (under the influence of the description of space found in the Sefer Yetsira: Up, Down, East, West, South, North, and Center), or the Six Sefirot of the Male (Zeir Anpin) united with the Seventh Sefirot of the Female (Nukva). Some say that one triangle represents the ruling tribe of Judah and the other the former ruling tribe of Benjamin. It is also seen as a dalet and yud, the two letters assigned to Judah. There are 12 Vav, or "men," representing the 12 tribes or patriarchs of Israel. In 1354, King of Bohemia Charles IV prescribed for the Jews of Prague a red flag with both David's shield and Solomon's seal, while the red flag with which the Jews met King Matthias of Hungary in the 15th century showed two pentagrams with two golden stars. In 1460, the Jews of Ofen (Budapest, Hungary) received King Matthias Corvinus with a red flag on which were two Shields of David and two stars. In the first Hebrew prayer book, printed in Prague in 1512, a large hexagram appears on the cover. In the colophon is written: "Each man beneath his flag according to the house of their fathers…and he will merit to bestow a bountiful gift on anyone who grasps the Shield of David." In 1592, Mordechai Maizel was allowed to affix "a flag of King David, similar to that located on the Main Synagogue" on his synagogue in Prague. Following the Battle of Prague (1648), the Jews of Prague were again granted a flag, in recognition in their contribution to the city's defense. That flag showed a yellow hexagram on a red background, with a star placed in the center of the hexagram. The symbol became representative of the worldwide Zionist community, and later the broader Jewish community, after it was chosen to represent the First Zionist Congress in 1897. In the early 20th century, the symbol began to be used to express Jewish affiliations in sports. 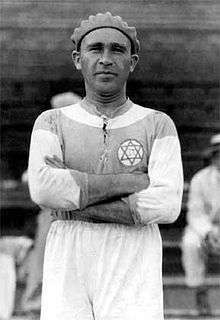 Hakoah Vienna was a Jewish sports club founded in Vienna, Austria, in 1909 whose teams competed with the Star of David on the chest of their uniforms, and won the 1925 Austrian League soccer championship. Similarly, The Philadelphia Sphas basketball team in Philadelphia (whose name was an acronym of its founding South Philadelphia Hebrew Association) wore a large Star of David on their jerseys to proudly proclaim their Jewish identity, as they competed in the first half of the 20th century. In boxing, Benny "the Ghetto Wizard" Leonard (who said he felt as though he was fighting for all Jews) fought with a Star of David embroidered on his trunks in the 1910s. World heavyweight boxing champion Max Baer fought with a Star of David on his trunks as well, notably, for the first time as he knocked out Nazi Germany hero Max Schmeling in 1933; Hitler never permitted Schmeling to fight a Jew again. A Star of David, often yellow, was used by the Nazis during the Holocaust to identify Jews. After the German invasion of Poland in 1939, there initially were different local decrees forcing Jews to wear distinct signs (e.g. in the General Government, a white armband with a blue Star of David; in the Warthegau, a yellow badge, in the form of a Star of David, on the left breast and on the back). If a Jew was found in public without the star, he could be severely punished. 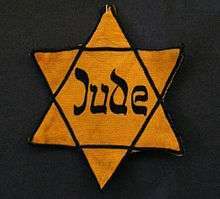 The requirement to wear the Star of David with the word Jude (German for Jew) was then extended to all Jews over the age of six in the Reich and in the Protectorate of Bohemia and Moravia (by a decree issued on September 1, 1941 and signed by Reinhard Heydrich) and was gradually introduced in other Nazi-occupied areas. Others, however, wore the Star of David as a symbol of defiance against Nazi antisemitism, as in the case of United States Army private Hal Baumgarten, who wore a Star of David emblazoned on his back during the 1944 invasion of Normandy. 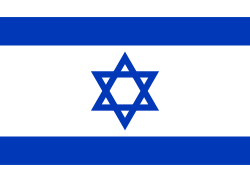 The flag of Israel, depicting a blue Star of David on a white background, between two horizontal blue stripes was adopted on October 28, 1948, five months after the country's establishment. The origins of the flag's design date from the First Zionist Congress in 1897; the flag has subsequently been known as the "flag of Zion". 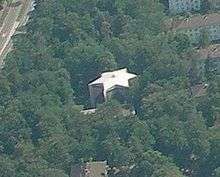 Many Modern Orthodox synagogues, and many synagogues of other Jewish movements, have the Israeli flag with the Star of David prominently displayed at the front of the synagogues near the Ark containing the Torah scrolls. Magen David Adom (MDA) ("Red Star of David" or, translated literally, "Red Shield of David") is Israel's only official emergency medical, disaster, ambulance service. It has been an official member of the International Committee of the Red Cross since June 2006. 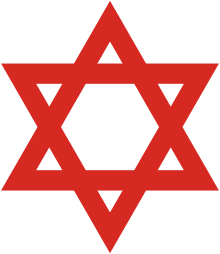 According to the Israel Ministry of Foreign Affairs, Magen David Adom was boycotted by the International Committee of the Red Cross, which refused to grant the organization membership because "it was [...] argued that having an emblem used by only one country was contrary to the principles of universality." Other commentators said the ICRC did not recognize the medical and humanitarian use of this Jewish symbol, a Red Shield, alongside the Christian cross and the Muslim crescent. Since 1948, the Star of David has carried the dual significance of representing both the state of Israel, and Jewish identity in general. In the United States especially, it continues to be used in the latter sense by a number of athletes. In baseball, Jewish major leaguer Gabe Kapler had a Star of David tattooed on his left calf in 2000, with the words "strong-willed" and "strong-minded", major leaguer Mike "SuperJew" Epstein drew a Star of David on his baseball glove, and major leaguer Ron Blomberg had a Star of David emblazoned in the knob of his bat which is on display at the Baseball Hall of Fame. NBA basketball star Amar'e Stoudemire, who says he is spiritually and culturally Jewish, had a Star of David tattoo put on his left hand in 2010. NFL football defensive end Igor Olshansky has Star of David tattoos on each side of his neck, near his shoulders. Israeli golfer Laetitia Beck displays a blue-and-white magen david symbol on her golf apparel. In boxing, Jewish light heavyweight world champion Mike "The Jewish Bomber" Rossman fought with a Star of David embroidered on his boxing trunks, and also has a blue Star of David tattoo on the outside of his right calf. Other boxers fought with Stars of David embroidered on their trunks include world lightweight champion, world light heavyweight boxing champion Battling Levinsky, Barney Ross (world champion as a lightweight, as a junior welterweight, and as a welterweight), world flyweight boxing champion Victor "Young" Peres, world bantamweight champion Alphonse Halimi, and more recently World Boxing Association super welterweight champion Yuri Foreman, light welterweight champion Cletus Seldin, and light middleweight Boyd Melson. Welterweight Zachary "Kid Yamaka" Wohlman has a tattoo of a Star of David across his stomach, and welterweight Dmitriy Salita even boxes under the nickname "Star of David". Maccabi clubs still use the Star of David in their emblems. The Jewish Encyclopedia cites a 12th-century Karaite document as the earliest Jewish literary source to mention a symbol called "Magen Dawid" (without specifying its shape). The name 'Shield of David' was used by at least the 11th century as a title of the God of Israel, independent of the use of the symbol. The phrase occurs independently as a Divine title in the Siddur, the traditional Jewish prayer book, where it poetically refers to the Divine protection of ancient King David and the anticipated restoration of his dynastic house, perhaps based on Psalm 18, which is attributed to David, and in which God is compared to a shield (v. 31 and v. 36). The term occurs at the end of the "Samkhaynu/Gladden us" blessing, which is recited after the reading of the Haftara portion on Saturday and holidays. Seven names of angels precede the mezuzah: Michael, Gabriel, etc. …Tetragrammaton protect you! And likewise the sign, called the "Shield of David", is placed beside the name of each angel. This book is of Karaite, and not of Rabbinic Jewish origin, and it does not describe the shape of the sign in any way. In Unicode, the "Star of David" symbol is U+2721 (✡︎). At London Heathrow Airport in the early 1950s were built six runways in ✡︎ layout, each a bit over a mile long. Some criminal gangs, including the Gangster Disciples and those affiliated with the Folk Nation, use the Star of David as their symbol. In the case of the Gangster Disciples this is a reference to the group's founder, David Barksdale, also known as "King David". The insignia of the Trinidad and Tobago Police Service has included a hexagram since the end of the 19th century. 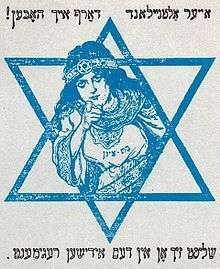 A recruitment poster published in American Jewish magazines during WWI. Daughter of Zion (representing the Jewish people): Your Old New Land must have you! Join the Jewish regiment. ↑ The Flag and the Emblem, Israeli Ministry of Foreign Affairs, quote "Unlike the menora (candelabrum), the Lion of Judah, the shofar (ram's horn) and the lulav (palm frond), the Star of David was never a uniquely Jewish symbol." ↑ The Flag and the Emblem, Israeli Ministry of Foreign Affairs, quote "According to Sholem, the motive for the widespread use of the Star of David was a wish to imitate Christianity. During the Emancipation, Jews needed a symbol of Judaism parallel to the cross, the universal symbol of Christianity." ↑ Leonora Leet , "The Hexagram and Hebraic Sacred Science" in :The Secret Doctrine of the Kabbalah, 1999, 212-217. ↑ Scholem 1949, p. 246:"In the beginning these designs had no special names or terms, and it is only in the Middle Ages that definite names began to be given to some of those most widely used. There is very little doubt that terms like these first became popular among the Arabs, who showed a tremendous interest in all the occult sciences, arranging and ordering them systematically long before the Practical Cabalists thought of doing so. It is not to be wondered at, therefore, that for a long time both the five-pointed and the six-pointed stars were called by one name, the "Seal of Solomon," and that no distinction was made between them. This name is obviously related to the Jewish legend of Solomon's dominion over the spirits, and of his ring with the Ineffable Name engraved on it. These legends expanded and proliferated in a marked fashion during the Middle Ages, among Jews and Arabs alike, but the name, "Seal of Solomon," apparently originated with the Arabs. This term they did not apply to any one design exclusively; they applied it to an entire series of seven seals to which they attributed extreme potency in putting to flight the forces of the Demon." ↑ Scholem 1949, p. 244:"It is not to be found at all in medieval synagogues or on medieval ceremonial objects, although it has been found in quite a number of medieval Christian churches again, not as a Christian symbol but only as a decorative motif. The appearance of the symbol in Christian churches long before its appearance in our synagogues should warn the overzealous interpreters. " ↑ Scholem 1949, p. 250:"From Prague this official use of the symbol spread out. In 1655 it is found on the seal of the Viennese community, and in 1690 on the seal of the community of Kremsier, in Moravia. On the wall of the old synagogue of the community of Budweis (Southern Bohemia), which was abandoned by the Jews in 1641, there are representations of Shields of David alternating with roses; apparently this is the oldest synagogue outside of Prague on which this symbol is to be found. In his youth, R. Jonathan Eybeschuetz might have been able to see it on the seal of the community of EybeSchuetz. A number of communities in Moravia used as a seal the Shield of David alone, with the addition of the name of the community. Others had on their seals a lion holding the Shield of David, like the community of Weiskirchen at the beginning of the 18th century. In very isolated instances the figure of the Shield of David was used in southern Germany also, doubtless under the influence of the Prague community. In other countries, we do not generally find the Shield of David in use before the beginning of the 19th century, either on community seals, or on the curtains of the Ark, or on Torah mantles." ↑ The Flag and the Emblem, Israeli Ministry of Foreign Affairs, quote "The Star of David became the emblem of Zionist Jews everywhere. Non-Jews regarded it as representing not only the Zionist current in Judaism, but Jewry as a whole." 1 2 Scholem 1949, p. 251:"Then the Zionists came, seeking to restore the ancient glories-or more correctly, to change the face of their people. When they chose it as a symbol for Zionism at the Basle Congress of 1897, the Shield of David was possessed of two virtues that met the requirements of men in quest of a symbol: on the one hand, its wide diffusion during the previous century-its appearance on every new synagogue, on the stationery of many charitable organizations, etc.-had made it known to everybody; and on the other, it was not explicitly identified with a religious association in the consciousness of their contemporaries. This lack became its virtue. The symbol did not arouse memories of the past: it could be filled with hope for the future." ↑ "King Solomon's Seal", MFA, King Solomon-s Seal. ↑ Herbert M. Adler, JQR, vol. 14:111. Cited in "Magen David", Jewish Encyclopedia , retrieved 2010, May 28. ↑ Rabbi Blumenkrantz, "The Seder", The Laws of Pesach: A Digest 2010: Chap. 9. See also, , retrieved 2010 May 28. 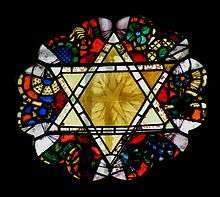 ↑ "Magen David", Ask the Rabbi , retrieved 2010, May 28. ↑ Simon Jacobson, op. ed., "Tzav-Passover: The Seder Plate", A Meaningful Life, , retrieved 2010 May 28. ↑ Gershom Scholem shows conclusively they do not form a hexagram. See, Hatakh ha-Zahav, Hotam Shelomoh u-Magen-David (Poalim, Hebrew) 1990:156. ↑ Reuven Kashani, The National Flag The Israel Review of Arts and Letters, 1998/107-8, Israel Ministry of Foreign Affairs (1999). "In 1648, the Jews of Prague were again allowed a flag, in acknowledgment of their part in defending the city against the Swedes. On a red background was a yellow Shield of David, in the centre of which was a Swedish star." ↑ "The Flag and the Emblem". GxMSDev. Retrieved 18 April 2016. ↑ "The Project Gutenberg eBook of The Jewish State, by Theodor Herzl.". Retrieved 18 April 2016. ↑ Brenner, Michael; Reuveni, Gideon (2006). Emancipation through muscles: Jews and sports in Europe. ISBN 0803205422. Retrieved February 17, 2011. ↑ Encyclopedia of American Jewish history. ABC-CLIO. 2007. ISBN 9781851096381. Retrieved February 17, 2011. ↑ Outside the box: a memoir. Rodale. 2006. ISBN 9781594862571. Retrieved February 17, 2011. ↑ Philadelphia Jewish life, 1940–2000. Temple University Press. 2006. ISBN 9781566399999. Retrieved February 17, 2011. ↑ Kirsch, George B; Harris, Othello; Nolte, Claire Elaine (2000). Encyclopedia of ethnicity and sports in the United States. ISBN 9780313299117. Retrieved February 19, 2011. ↑ Paul Lukas (April 2, 2007). "Uni Watch: Passover edition". ESPN. p. 2. Retrieved February 17, 2011. ↑ Beggy, Carol; Shanahan, Mark (September 24, 2004). "Sox pair weigh holiday play; councilor swept up". The Boston Globe. Retrieved February 17, 2011. ↑ "Jewish Stars". Cleveland Jewish News. April 16, 2010. Retrieved February 17, 2011. ↑ Ain, Stewart (September 8, 2006). "Fast Balls Keep Flying At Mel". The Jewish Week. Retrieved February 17, 2011. ↑ "It started as a great idea, then fate stepped in". Jewish Tribune. September 29, 2005. Retrieved February 17, 2011. ↑ Salkin, Allen. "Where have you gone, Sandy Koufax?". Charlotte.creativeloafing.com. Retrieved February 17, 2011. ↑ Klopman, Michael (August 2, 2010). "Is Amare Stoudemire Jewish? Knick Shows Star Of David Tattoo, Wears Yarmulke (VIDEO)". Huffington Post. Retrieved February 17, 2011. ↑ "Knicks star Amar'e Stoudemire keeps things kosher". The New York Post. August 20, 2010. Retrieved February 17, 2011. ↑ "Are you ready for some football? » Kaplan's Korner on Jews and Sports". New Jersey Jewish News. September 14, 2009. Retrieved February 17, 2011. ↑ Whisler, John (August 1, 2009). "Cowboys add muscle on defense with Olshanksy". Houston Chronicle. Retrieved February 17, 2011. ↑ "Tenacious D – by Nisha Gopalan". Tablet Magazine. November 14, 2008. Retrieved February 17, 2011. ↑ "Yom Kippur a No Go for Young Golfer Laetitia Beck". Algemeiner Journal. October 7, 2011. Retrieved September 17, 2013. ↑ Sagui, Miki (September 7, 2011). "Laetitia Beck, Israel's Tiger Woods". Ynetnews.com. Retrieved September 17, 2013. 1 2 The Big Book of Jewish Sports Heroes: An Illustrated Compendium of Sports History and The 150 Greatest Jewish Sports Stars. SP Books. 2007. ISBN 9781561719075. Retrieved February 17, 2011. ↑ New York, Volume 39. New York. 39. 2006. Retrieved February 17, 2011. ↑ Pat Putnam (December 18, 1978). "Mom is Jewish, Dad is Italian, and Mike Rossman—the Star". Sports Illustrated. Retrieved February 17, 2011. ↑ The 1930s. Weigl Educational Publishers. 2000. ISBN 9781896990644. Retrieved February 17, 2011. ↑ Schaap, Jeremy (2007). Triumph: the untold story of Jesse Owens and Hitler's Olympics. ISBN 0618688226. Retrieved February 17, 2011. ↑ Ellis Island to Ebbets Field: Sport and the American Jewish Experience. Oxford University Press. 1993. ISBN 9780195359008. Retrieved February 17, 2011. ↑ Vials, Chris (2009). Realism for the masses: aesthetics, popular front pluralism, and U.S. culture, 1935–1947. ISBN 9781604733495. Retrieved February 17, 2011. ↑ Wiggins, David. Sport in America eBook. II. ISBN 9781450409124. Retrieved February 17, 2011. ↑ Katz, Yossi (2010). A Voice Called: Stories of Jewish Heroism. ISBN 9789652294807. Retrieved February 19, 2011. ↑ "Papa Said Knock You Out: Issue 53's Zachary Wohlman Fights This Thursday". Mass Appeal. November 11, 2013. Retrieved March 31, 2014. ↑ Isaac Barrio (July 19, 2006). "Dmitriy "STAR OF DAVID" Salita in Main Event". Hardcoreboxing.net. Retrieved February 17, 2011. ↑ Football: a sociology of the global game. Wiley-Blackwell. 1999. ISBN 9780745617695. Retrieved February 17, 2011. ↑ A similar term, "Shield of Abraham" appears in the first blessing of the "Amidah" prayer, which was written in early Rabbinic times (around year 1, a millennium before the first documentation of the term in reference to a six-point star). That term is probably based on Genesis 15:1, where God promises to shield Abraham. ↑ "Australian Heritage Database". Retrieved 18 April 2016. ↑ "The star of David". The Trinidad Guardian Newspaper. Retrieved 18 April 2016. Wikimedia Commons has media related to Star of David.